Now, a research team from the University of Luxembourg has identified a technique that enables an anti-ordered state, which will lead to innovative material characteristics and perhaps unique technical applications, like artificial muscles for soft robotics. The results of the study have been reported in the scientific journal, Science Advances. The research group of Professor Jan Lagerwall at the University of Luxembourg explores the properties of liquid crystals, which can be seen in a majority of areas, ranging from displays in many electronic devices to cell membranes in the body. The material integrates liquid-like flexibility and mobility as well as its molecules’ long-range order; the latter is otherwise a standard trait of solid crystals. This leads to extraordinary properties that make liquid crystals so much versatile that they are selected for performing critical functions by nature and also by billion-dollar companies. Most of the properties of a material rely on the way its molecules are organized. Ever since the late 1930s, a mathematical model has been used by physicists to elucidate the liquid crystals' molecular order. A number assigned by the so-called order parameter denotes the way the molecules are arranged in an ordered fashion. This mathematical model utilizes a positive range to elucidate the liquid crystals that people are used to. In addition, the model can even assign a negative range describing an “anti-ordered” state, in which the molecules would evade a specific direction instead of aligning along it. To date, this negative range continued to be stringently theoretical, because, in practice, none of the liquid crystals had developed an anti-ordered state. The typical theories proposed for liquid crystals indicate that while such a state can possibly be achieved, it will not be stable. You can compare this to a slide that has a very light bump in the middle. You may slow down when you reach the bump, in our case the unstable anti-ordered state, but not enough so you stop, and therefore you will go down all the way to the stable state, the global energy minimum, where you inevitably end up with positive order. If you could manage to stop the ride at the bump, a negative range would be possible. Jan Lagerwall, Professor, University of Luxembourg. This is precisely what V.S.R. Jampani, the paper’s main author and co-workers realized for the first time in their analysis. The trick for preventing the system from reaching the global energy minimum is to gently polymerize it into a loosely connected network while it is dissolved in a normal liquid solvent. This network is then stretched in all directions within a plane, or compressed along a single direction perpendicular to the plane, such that the molecules forming the network align into the plane, but without any particular direction in that plane. Dr V.S.R. Jampani, Study Main Author, University of Luxembourg. The liquid crystal phase forms when the solvent is evaporated and, owing to the network’s unusual in-plane stretching, it is pushed to implement the negative order parameter state in which the molecules evade the direction of the normal to the plane. This liquid crystal has no choice but to settle with the secondary energy minimum, since the global energy minimum is made inaccessible by the network. When a second round of polymerization strengthens the network, it becomes possible to study the behavior as a function of temperature. “Liquid crystal networks are fascinating for positive as well as negative order parameter, because the ordering—or anti-ordering—in combination with the polymer network allows it to spontaneously change its shape in response to temperature changes. The liquid crystal network is effectively a rubber that stretches or relaxes on its own, without anyone applying a force,” stated Professor Lagerwall. It was eventually observed that the behavior of the negative order parameter liquid crystal rubber is precisely reverse to that of standard liquid crystal rubbers. Optically, when a normal liquid crystal rubber shows a certain color between crossed polarizers, the negative order parameter version shows the complementary color. Mechanically, when a normal liquid crystal rubber contracts along one direction and expands in the plane perpendicular to it, the negative order parameter rubber expands along the first direction and shrinks in the perpendicular plane. 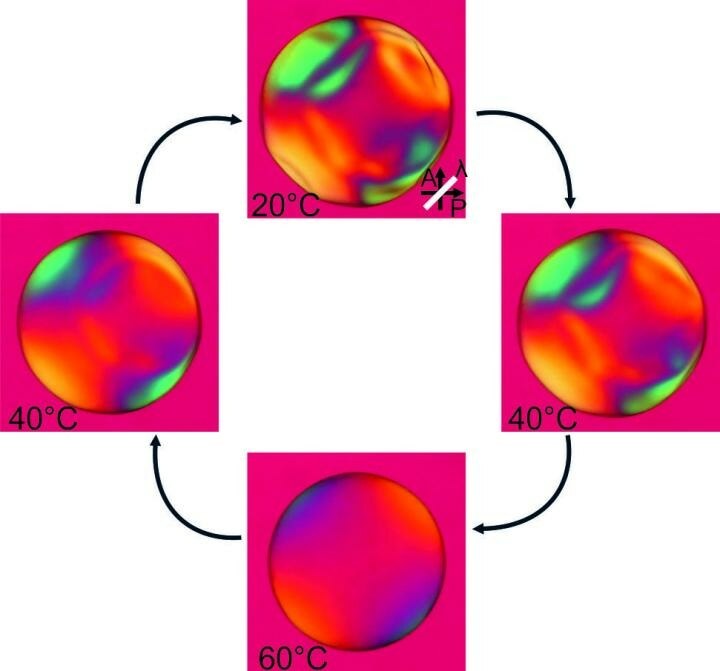 Negative order parameter liquid crystal rubbers in the form of millimeter-sized spherical shells were developed by the researchers. The team then cut these liquid crystal rubbers into tinier pieces with a variety of shapes. Based on the way the cut was made, a wide range of shape-altering behavior can possibly be achieved, demonstrating that the system is capable of functioning as a soft “actuator,” that is, effectively an artificial muscle. Since the positive and negative order liquid crystal rubbers behave in reverse ways, this presents new, interesting ways to integrate the two, to create a composite actuator that is more effective, for example, for soft robotics. When the negative-order actuator responds slowly, the positive-order one actuates rapidly, and vice versa. From an ultimate physics standpoint, the physical existence of the formerly-only hypothetically predicted anti-ordered liquid crystal state paves the way for a number of interesting experiments and also the development of a theory for the behavior of self-organizing soft matter.